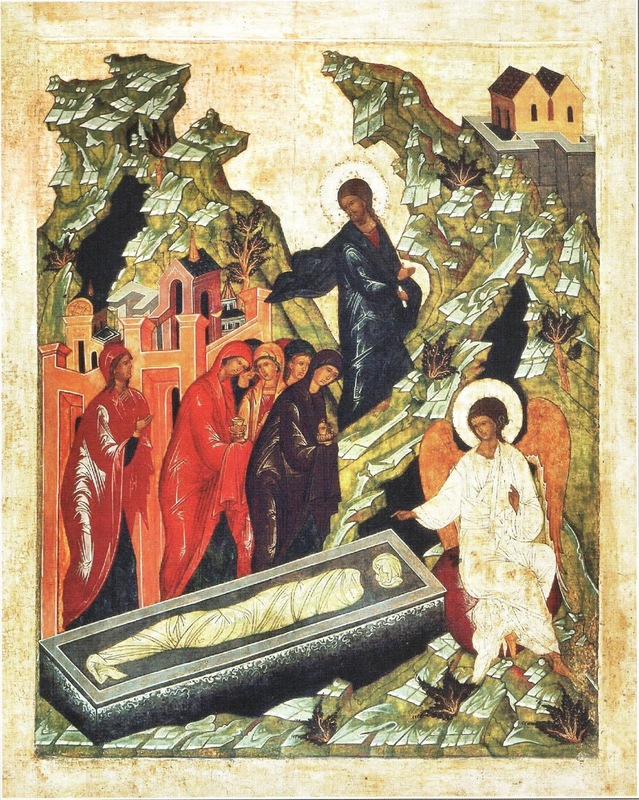 At the Divine Liturgy of Easter Sunday, the Byzantine Rite does not read one of the various Gospel accounts of the Resurrection, but rather, the Prologue of the Gospel of St John, 1, 1-17. (This is three verses longer than the Roman version read at the day Mass of Christmas, and at the conclusion of almost every Mass.) There are several reasons for this choice, which may seem at first rather counter-intuitive. Greek Evangeliary, date unspecified; Bibliothèque nationale de France, Supplément grec 27, folio 1r. - St John the Evangelist is shown dictating his Gospel to his amanuensis St Prochoros, who was one of the first seven deacons. As can be seen from the folio number, this is at the very beginning of the manuscript; Byzantine Gospel books are traditionally arranged according to the order of their liturgical use, starting with Easter. The Resurrection is the culmination of the salvation of the whole of our nature, body and soul together, which are both raised from the dead with Christ. In verse 16, St John says “we have all received of His fullness, and grace for grace”; this fullness is the totality of salvation accomplished in the Resurrection, including the flesh which the Word became, as stated earlier in the Prologue. The last verse, “For the law was given by Moses; grace and truth came by Jesus Christ,” echoes St Paul’s teaching that “Christ hath redeemed us from the curse of the law,” (Galatians 3, 13), a theme which becomes prominent later on in the Easter season in the Byzantine Rite. On a practical level, so to speak, the Resurrection is also proclaimed at the Easter vigil, and at Vespers on Easter Sunday. The Gospel of the former is the whole of Matthew 28, where the Roman Rite reads only the first 7 verses. This Gospel begins with the words “But on the evening of the Sabbath”, as the vigil itself was originally celebrated on the evening of Holy Saturday. (In practice, it is often anticipated to the morning.) The first part tells of the women at the tomb meeting first the angel, then the risen Christ Himself (1-10), followed by the bribing of the soldiers who guarded the tomb (11-15). The final part, the meeting of Christ with the eleven disciples in Galilee, contains His commission to “teach all nations, baptizing them in the name of the Father, and of the Son, and of the Holy Spirit”, a perfect choice for the baptismal ceremony par excellence. The period from the Ascension to Pentecost is not counted as part of the Easter season, as it is in the Roman Rite; there are therefore six Sundays of Easter, not seven. The first three being dedicated explicitly to the Resurrection, the three which follow are named for their Gospels, those of the Paralytic (John 5, 1-15), the Samaritan Woman (4, 5-42), and the Blind Man (John 9, 1-38). These three form an interesting trait d’union between the two great baptismal feasts, Easter and Pentecost. All three make prominent references to water: the paralytic is waiting to be healed in the pool of Bethsaida, while Christ speaks to the Samaritan woman of the “living water... springing up into life everlasting”, and sends the blind man to wash in the pool of Siloam. A Christian sarcophagus of the 3rd century, in the Pio-Christian collection of the Vatican Museums. The healed paralytic is shown in the middle, carrying his bed. This transition is underscored by the order in which these Gospels are read, with the story of the paralytic in chapter 5 before that of the Samaritan woman from chapter 4. In John’s Gospel, Christ’s prediction of the destruction of the temple is made to the Samaritan woman. “The woman saith to him, … ‘Our fathers adored on this mountain, and you (i.e. the Jews) say, that at Jerusalem is the place where men must adore.’ Jesus saith to her, … ‘the hour cometh, when you shall adore the Father neither on this mountain, nor in Jerusalem.’ ” The passage ends by saying that many Samaritans believed in Him, a declaration that, with the destruction of the temple, faith in the Jewish Messiah, and hence the worship of God, will pass to the gentile nations that enter the Church. The blind man is told to wash in the pool of Siloam, which St John himself explains “is interpreted ‘sent’. ” The Greek word used here for “sent – apestalmenos,” is a participle of the verb whose root also makes the word “apostolos – one who is sent.” Although the blind man himself was a Jew, the Fathers understood his blindness to prefigure the blindness of the gentiles, who are illuminated when the Apostles come to them, fulfilling Christ’s commandment to “…teach all nations; baptizing them in the name of the Father, and of the Son, and of the Holy Spirit.” In both East and West, but more prominently in the East, “illuminate” and its cognates are very often used to refer to the Sacrament of Baptism. Therefore, the three Gospels arranged in this particular sequence demonstrate the passage from the old worship in the Temple under the Law, through the Messiah to the Apostles, and hence to the Church.